One of the primary structural components of the human brain is Docosahexaenoic acid (DHA) which is an omega-3 fatty acid. DHA is the most abundant component present in the brain and retina that make up to 40% and 60% of it respectively. DHA is considered to be one of the significant nutrients necessary during pregnancy. DHA is considered to be one of the central factors for brain development of the child. Breast milk contains fatty acids of which, about 0.07% to 1.0% is DHA. During the third trimester of pregnancy, brain development is at its peak and it continues to grow till the age of one. DHA is present mainly in sea food. Vegetarian "mom-to-be" should probably depend on DHA supplements that have been prescribed by the doctor. Some of the vegetarian sources rich in Omega-3 fatty acids include walnuts, flax seeds, soy beans and tofu. Walnuts have to be consumed daily with other dry fruits to reap its maximum benefits. Flax seeds can be powdered and added to all your preparations. Soy bean and tofu can be made into a curry or any other form to suit your taste. However, there are a lot of controversies around soy, and so, it is best to use it minimally. It is important to protect omega-3 fats from oxidation in order to protect its properties. Vitamin E, the primary fat-soluble vitamin takes care of this! Foods rich in vitamin C, vitamin B3, vitamin B6, magnesium and zinc have to be eaten daily for better absorption of omega-3 fatty acids. 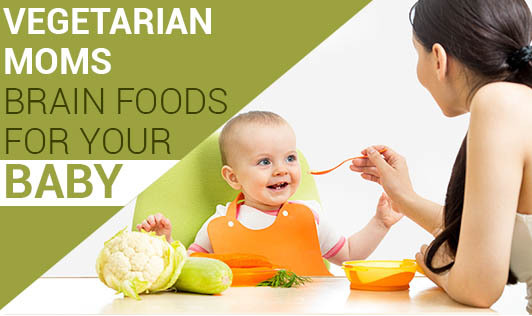 The foods mentioned above provide adequate DHA for your infant and helps in its brain development. Make sure your diet includes this wonder nutrient in it!